This post is part of a series. to read the previous post click here. Most organizations have an either all-in or all-out approach when it comes to ethics. They either care about the employee’s well-being or they completely ignore it and concentrate solely on the profits and the bottom-line. Most companies that adopt the latter approach to ethics usually have reports of employees witnessing misconduct in the workplace, be it time-theft or more serious white-collar crimes. To enforce/establish these types of cultures, companies use either a compliance-based or value-based approach. Compliance-based cultures use a more legalistic approach to ethics. In reality, this kind of culture revolves around risk management rather than ethics and lack a long-term focus or integrity. Employees are usually subject to quarterly or yearly compliance quizzes and checklists. Their impacts are usually very short-lived without proper reinforcement. 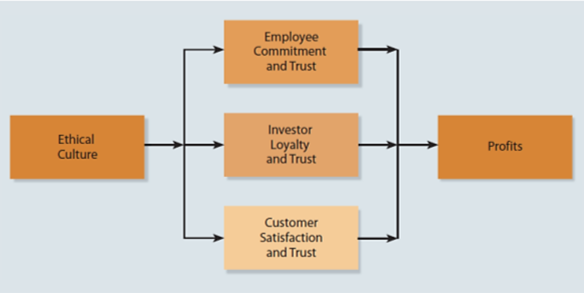 Value-based cultures on the other hand rely on mission-statements that define the firm and stakeholders’ relationships. They focus on values rather than law and feel less legalistic to the employees. To instill value-based cultures, buy-in from the top executive management and all levels of management is critical. Adopting the right kind of culture for your business can have very profound impact on your organization’s success. It brings a whole new level of commitment from employees who will be ready and willing to invest in the company. Employees will be more likely to make personal sacrifices for the company. The correlation is almost 1:1. The more a company is dedicated to ethics and shows concerns including a safe work environment, competitive salaries & benefit packages, the greater the employee’s dedication will be. It is therefore no surprise that companies that are perceived by their employees as being more honest and ethical are usually more profitable. This is because an ethical climate in an organization provides a platform for increased efficiency, productivity, profitability, and customer satisfaction. All keys to a successful and profitable venture. To implement an ethical culture in a work place can be rather challenging, depending upon the industry one is in. This is because studies support the fact that ethics are learned while interacting with others. As such, if you are in an industry that is known for unethical behaviors, it is very much more likely for a culture of deceit and corruption to persist within such an industry. Still, it is also a fact that superiors in a company have a strong influence over their subordinates and most employees will go along with the superior’s moral judgments in order to showcase their loyalty. The task of changing a corporate culture, especially when it comes to ethics, is therefore a full-time job that has to be taken seriously by upper management. 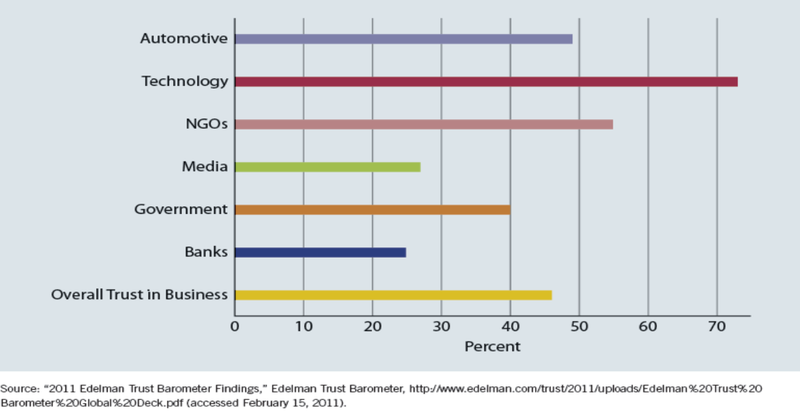 As shown in the chart below, different industries are trusted at varying levels by their stakeholders. As it may be observed, in this post 2008 recession era, banks have taken a real beating when it comes to trust. In the past 2 years, the problem has not been rectified either as can be seen in the chart below. 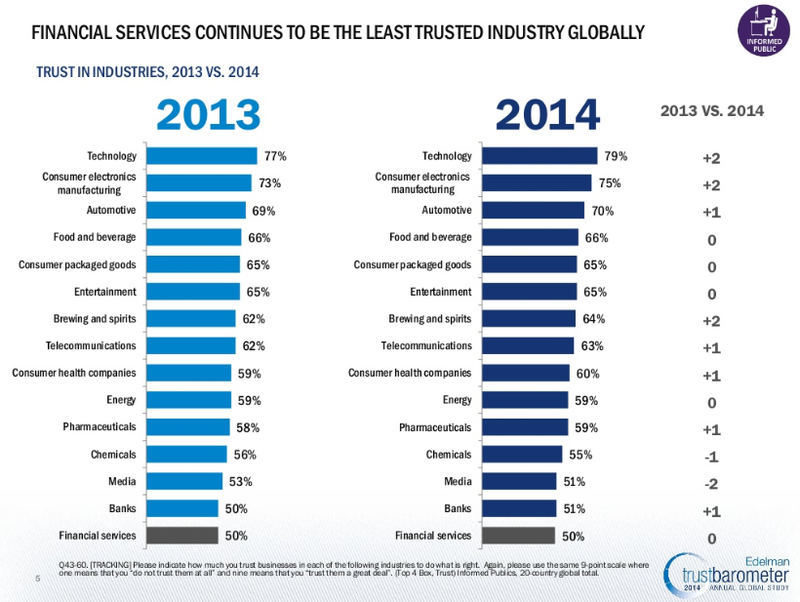 Trust in financial services sector has remained stagnant from 2013 to 2014. What remains to be seen is how perturbed the financial industry will be by these findings. Will the major players in the financial industry be making any radical re-branding moves in 2015 and what opportunities will they present to the consumers. Your thoughts, comments and questions are always welcomed. With the openness and transparency brought about by the internet age, ethics is suddenly top priority for businesses. With increased consumer awareness and knowledge, companies small and large have had to make meaningful adjustments to their ethic codes or face the consequences. At the very least, companies have had to come out and make a statement (when possible) and showcase what they are doing for the betterment of the community at large. Think of Monsanto, BP, Exxon Mobil, SeaWorld, and energy companies involved in fracking for example. Just a decade or two ago there wouldn’t have been so much awareness, so quickly, of what these companies are doing to the global environment. In today’s age, however, these companies must address ethic issues head-on. Moreover, there are documentary makers and journalists out there whose sole purpose in life is to find fault with companies that may be involved in unethical behaviors. CNN’s Blackfish and #IvoryTower documentaries are recent examples of these but there are many others including documentaries on Monsanto and various other chemical companies such as Food Inc., etc that highlight these social and ethical problems. What is at stake is now much larger than ever before. While the saying that “a sucker is born every minute” still holds true in most cases and most large corporations with questionable ethic codes have not gone out of business purely because of ethical issues alone, it is also a fact that consumers today are much more aware and smarter than at any other time in history. The recent documentary Blackfish, for example, has sent SeaWorld reeling and attendance at its parks have fallen 5 percent according to CBS. The documentary has mobilized animal rights activists and strained SeaWorld’s corporate partnerships. Virgin America, Alaska Air and Southwest Airlines have pared back sales and marketing deals with the theme park. What all this translates to is that if you are an unethical business, not only will you lose customers, but you will also lose your partners. And if you don’t turn things around soon enough, you could be forced into a position where you’d need to make drastic changes to your business model. The top priority has to be revisiting of the corporate ethics. 1) Ethical leaders have strong personal character. They do not bend to the organizational pressures or powers that be. 2) Ethical leaders have a passion to do what is right. 3) Ethical leaders are proactive. Being reactive is the thing of the past and is, in financial terms, a loss proposition. Ethical business leaders strive to be proactive and lead, rather than deal with problems as they arise. 4) Ethical leaders consider stakeholders’ interests. This is a very important concept to understand. They do not only consider stakeholders who are directly involved in the financial sense, i.e. investors, but rather stake holders in all aspects of the business including customers, vendors, and the communities that the business does business in. 5) Ethical leaders are transparent and actively involved in organizational decision-making. Pulling strings behind the scenes certainly was not a model of ethics in the 1950’s and neither is it now. An ethical leader leads by example and communicates his or her ideas to the entire organization. 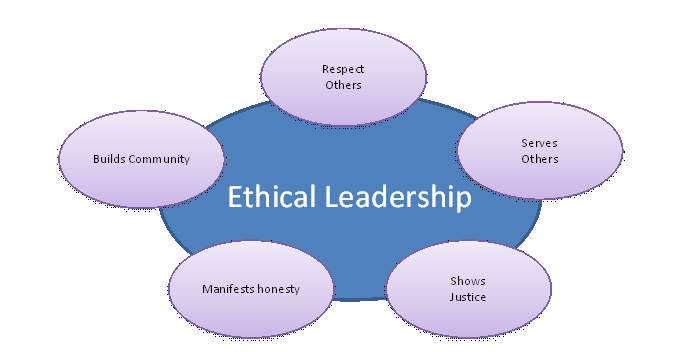 6) Ethical leaders are competent managers who take a holistic view of the firm’s ethical culture. This is to say that an ethical leader has to take responsibility for the entire company’s performance, not just any one or two specific departments that maybe operating ethically while the others do not. For most companies, it is with the intensity of ethical issues, individual factors, and business & organizational opportunities, that result in business ethics evaluations and decisions. An organization’s ethical culture is shaped by effective leadership. Top level support is required for ethical behavior to exist and persist within the walls of an organization. An ethical corporate culture in turn becomes a significant factor in ethical decision-making for the company. If a firm’s culture encourages, rewards, or does not monitor unethical behavior, employees will most likely act unethically. Regardless of the size of your organization, the following are two ways by which an ethical culture may be introduced and instilled within the employees. Luckily, it is not rocket science. 1) Formalize the Ethics code. This has to come from upper management. Send out memos, write down employee code of conducts, employee manuals, supplement forms and even create formal swearing-in ceremonies if necessary. 2) Encourage ethics via activities. These are informal methods that are used to convey management’s desire to create an ethical work environment. This could be through promotions, dress code, or extracurricular activities. The goal here is to subtly encourage ethical behaviors and get the buy-in from the employees. A balanced combination of both methods and buy-in from the executive management is absolutely crucial in setting the tone. In our next post here, we will explore the types of ethical cultures and their examples, as well as the correlation of culture and business performance.